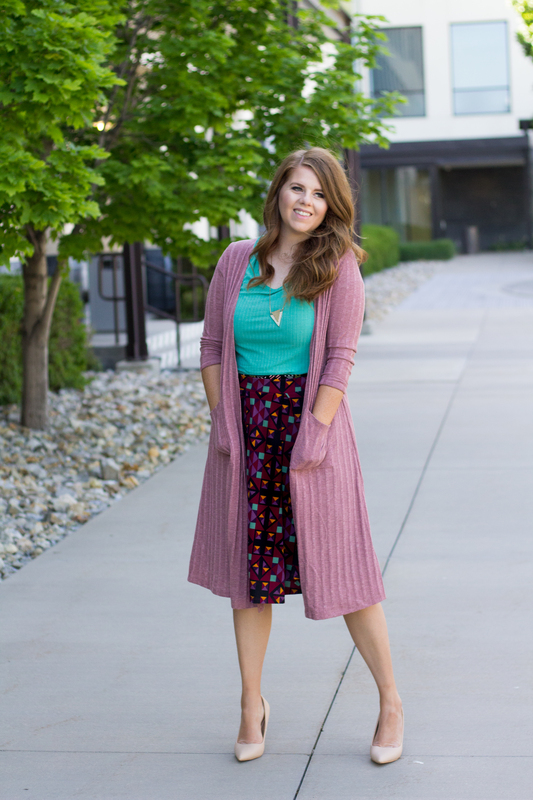 One Outfit Two Ways: Midi Skirt, Duster Cardigan & a tee. If you didn’t see my first way to style this outfit you can check it out here. Today One Skirt Two Ways will be styled with the Midi Skirt. I love midi skirts, they are so perfect for spring and summer. 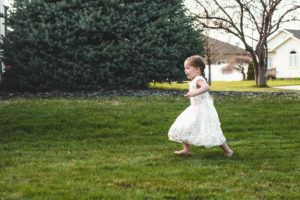 There are so many cute ways to style them as well. This turquoise top matches perfectly with the turquoise triangles on my skirt. Pulling colors from your patterns is such a chic way to style yourself. It keeps your outfit fresh and stylish. They don’t always have to be exact as long as it’s close. Rarely will someone be close enough to you to really see the difference. If they are that close to you they shouldn’t be thinking about the shade of your clothing if you know what I mean. 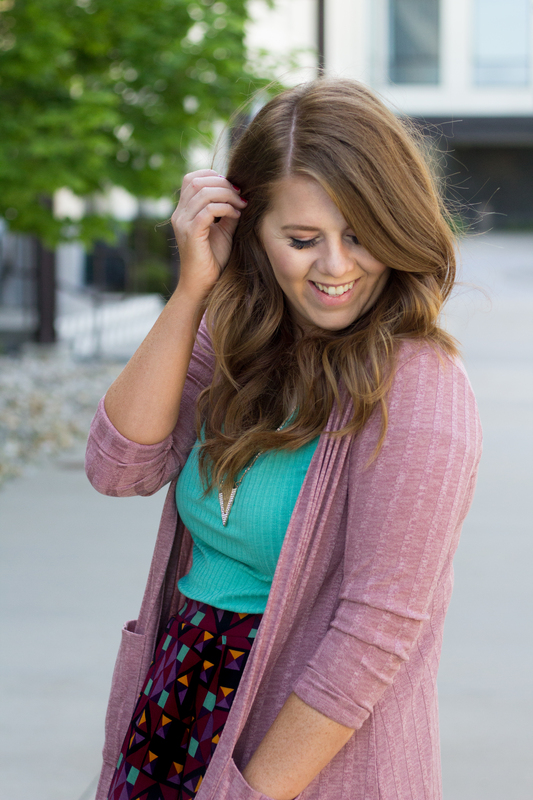 This ribbed top just adds such a fun touch of color to this outfit. 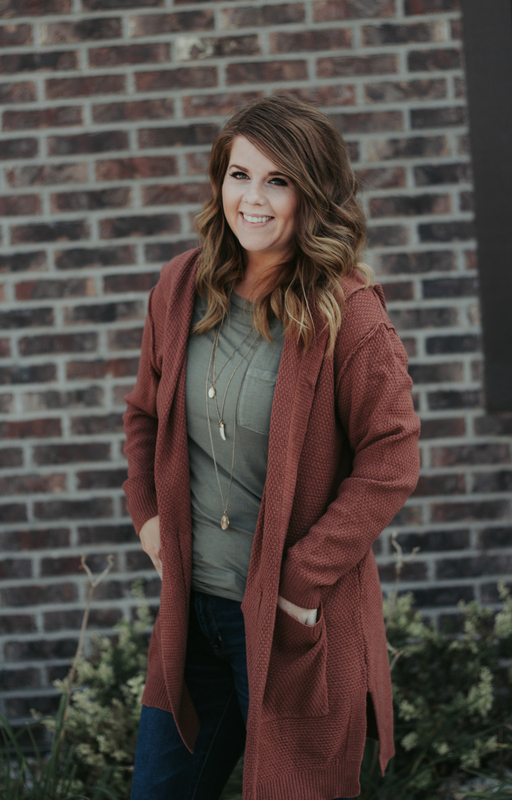 I love the Lularoe Classic Tee’s because they are chic enough to be dressed up, and loose and thin enough to be dressed down. For $35 that isn’t a bad way to go. Midi skirts are my love, especially midi skirts with pockets. Pockets are a girls best friend I tell ya. Perfect for hiding snacks and your phone in. 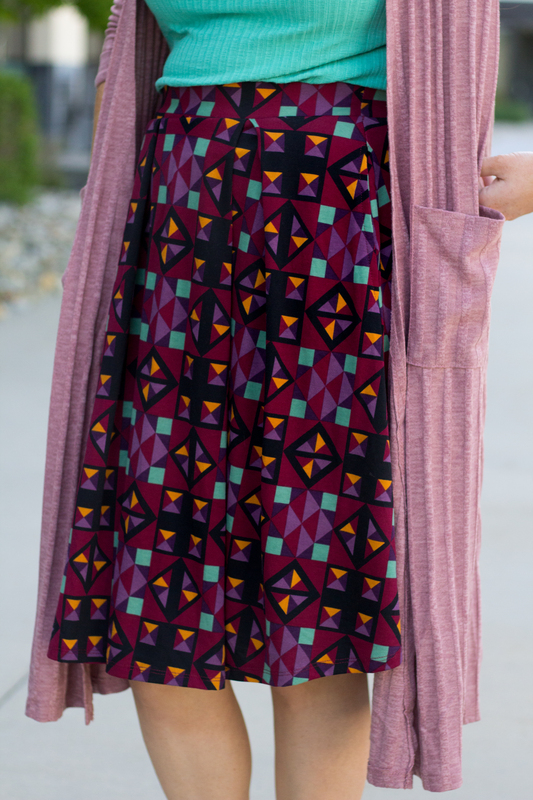 There are so many fun colors to pull from this skirt to style with. I love the pinks the purples the turqoise. I just love coloful pieces to style with. It again, helps me get more out of my wardrobe so I can stay on budget. I love love love how this whole outfit looks together. *Tip: When styling the midi skirt try to have the top wrap around the smallest part of your waist. 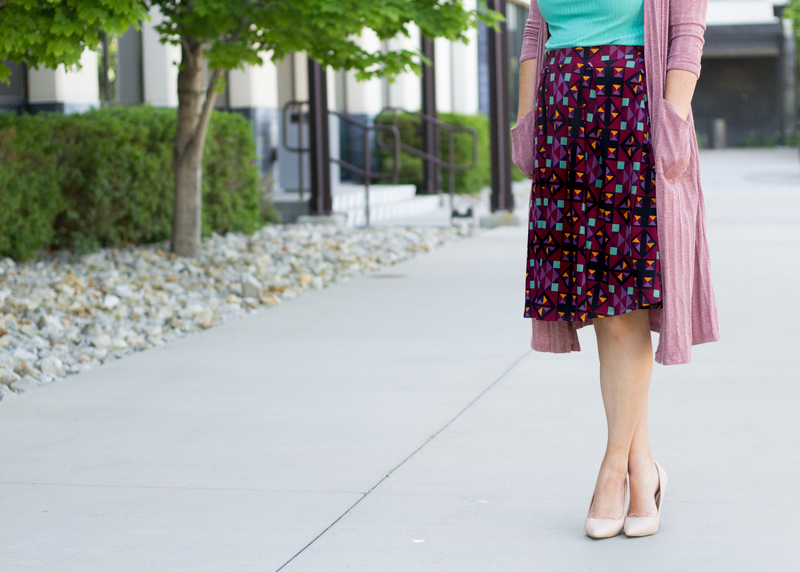 I love pairing a long cardigan with the Madison skirt. I did one outfit here with one and it is one of my most favorite outfits ever. It pulls the pink out of the skirt and it looks so polished and professional but could also but styled down for a casual day at the park. I really cannot express to you how much I love reusing pieces and getting more for my money with them.